JOH Chronicles: Presenting... Andre as..... John Darling. Presenting... Andre as..... John Darling. 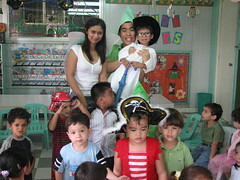 Today was "Never Land Day" at Andre's school. 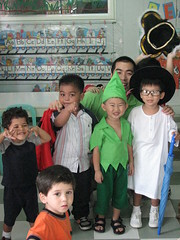 The children were encouraged to come as Peter Pan, Wendy, Michael, John, Captain Hook, the crocodile, mermain or native American Indians. Now how does one get a costume for less then P100? Easy, make one! The outfit was a hit. While there were Tinks and Peters aplenty, there was only one John Darling. 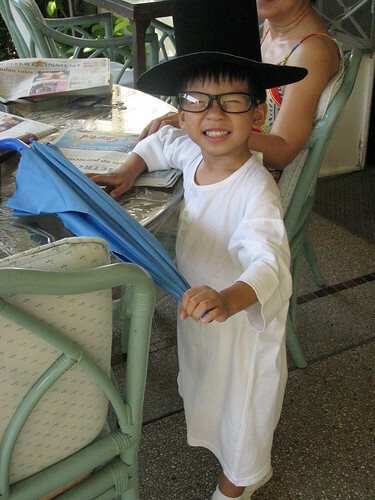 The hat I painstakingly created just barely survived the day as each boy tried it on for size. =) Now on to the next project: "Once upon a time...."